José Joaquín (Arias) Bautista (born July 25, 1964, in Baní, Dominican Republic). Jose is a former right-handed pitcher who played in Major League Baseball from 1988 to 1997. He is observantly Jewish and was born to a Domican father and an Israeli mother. Bautista was signed by the New York Mets as an amateur free agent in April 1981. In 1984 he was 13-4 with a 3.13 ERA for Columbia in the South Atlantic League, and in 1985 he was 15-8 with a 2.34 ERA for Lynchberg in the Carolina League. 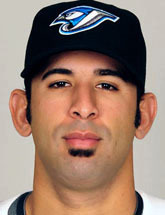 Bautista spent seven years in the New York Mets system before being selected by the Baltimore Orioles in the December 1987 rule V draft. 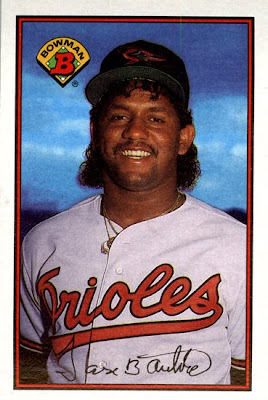 He joined the Orioles rotation in 1988, spending four years with them before moving to the Chicago Cubs (1993-94), San Francisco Giants (1995-96), Detroit Tigers (1997), and St. Louis Cardinals (1997). As a rookie he went 6-15 with 76 strikeouts and a 4.30 ERA in 171⅔ innings, including 25 starts and three complete games, but he never was able to fulfill the potential that he showed in his season debut. He resurfaced as a reliever with the Cubs in 1993, going 10-3 with a 2.82 ERA and 111⅔ innings in 58 appearances (7 as a starter). He kept batters to a .193 batting average in games that were late and close. After going 4-5 for Chicago in 1994 while pitching in 58 games (2nd in the league), he pitched with San Francisco the next two years and spent 1997 with Detroit and St. Louis for his last Major League season. In a nine-season career, Bautista posted a 32-42 record with 328 strikeouts and a 4.04 ERA in 312 games, including three saves, 49 starts, 4 complete games, and 685⅔ innings of work. Bautista was a pitching coach for the Burlington Bees in 2001-02, for the Idaho Falls Chukars in 2004-06, and for the Burlington Royals in 2007. He is now the Latin roving instructor for the Chicago White Sox. José Antonio Bautista (born October 19, 1980 in Santo Domingo, Dominican Republic). Because of this mistaken identity, I also have to retroactively designate a new Macher of the Day for April 23. 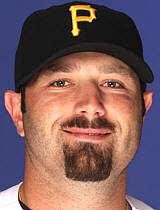 The deserving choice is John Grabow, he of the perfect 0.00 ERA!